At Jerimuda we are committed to using the best and freshest seasonal produce. Sourced locally or from our own grounds. Farm fresh fruit and vegetables are the key ingredients in our warm and welcoming country cooking. In winter, have a coffee and read the paper in front of our cosy lounge fire. In summer, relax by the pool or in the spa, or take a leisurely stroll around the grounds. Jerimuda is ideal for that weekend escape. If you are feeling more energetic you may like to take advantage of our deepwater river frontage. The North Wing boosts a queen sized bed and includes a spa bathroom. 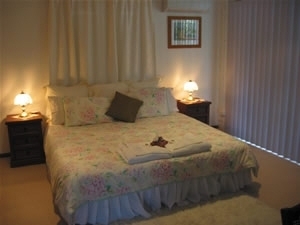 The room also comes with tea and coffee making facilities, fridge, TV/DVD/VCR player and CD/radio. The South Wing boosts a queen sized bed and includes a spa bathroom. The room also comes with tea and coffee making facilities, fridge, TV/DVD/VCR player and CD/radio. 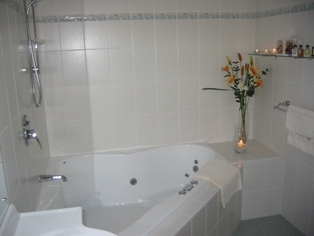 The West Wing is the ideal room for that extended stay you have been planning. Includes a king sized bed and is fully self contained. The room also comes with TV/DVD/VCR player and CD/radio. 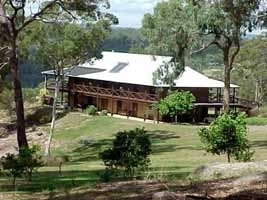 Jerimuda B&B while not set-up for children, we can take a child upto 18 months old only. Private under cover parking for guests, on level ground and easy access to rooms. 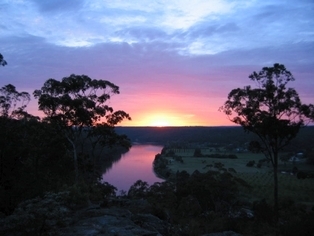 The Historic hawkesbury area, has alot of history, going back to the first settlers in NSW. We are only 20mins from Historic township of Windsor where you will find Antique shops, Galleries,Vineyards, Restaurants,Museums,Observatories, Architecture and golf courses,or take a river cruise on The Paddle Wheeler.Visit near by Historic Wisemans Ferry or Richmond or the wonderful Blue Mountains .